Costs – Find out more about the cost of tree removal, stump removal and seasonal tree maintenance before calling professionals in Dayton. FAQs – What trees should you plant in Dayton, depending on current pests and diseases? Which fruit trees will thrive in the climate or not? We have this information for you below. Services – Need to call a professional? Check our list of professionals in the Dayton area. How Much Do Tree Services Cost in Dayton? Maintaining trees in Dayton, Ohio is vital in order to give them the best chance of surviving amid unfavorable conditions like drought or disease. Additionally, homeowners in town are required to keep their street trees in good condition. Here is a summary of the costs that homeowners in Dayton can expect, whether routine maintenance or outright tree removal is in order. Whether a landscape tree dies before its time or lives to a ripe old age, it will need to be removed once it becomes hazardous due to weak or rotting wood. The price of tree removal in Dayton is relatively affordable compared to other locations, with an average cost of $550. Few pay more than around $660 although small, simple tree removals may be as cheap as $100. The toughest and tallest trees could cost as much as $1,200 to remove. Following a tree’s removal, the stump must be ground up with special equipment. In Dayton, this usually costs between $85 and $140 for a large stump. For a medium-sized stump, the price might be slightly cheaper but not by more than $10. In general, the more it cost to remove the tree, the more it will cost to grind up its stump. The average cost for tree maintenance in Ohio is almost $300, with a common range between $240 and $350 according to residents of the Buckeye State. Some maintenance projects pose greater difficulties to contractors, however. 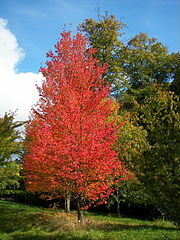 This is true of very tall or large trees, such as Elms and Poplars. The harder it is for an arborist to ascend the tree and do the work safely, the more expensive routine tree maintenance will be. The peak price reported by Ohio residents is approximately double the average at $600. A Tree City USA for more than two decades, Dayton, Ohio is a short distance from Appalachian Hardwood territory where first- and second-growth cedar glades and woodlands of beech and maple trees prevail across the landscape. Learn more about trees you might see throughout this city. Ohio is famous for its tall trees, including some normally considered diminutive. The tallest known sassafras tree, for example, resides in Dayton’s Montgomery County. Among the tallest trees in town are the lofty narrowleaf ash trees found in the local Woodland Cemetery and Arboretum. The state tree of Ohio, the buckeye, is another tall arbor planted in many Dayton landscapes. The City holds adjacent property owners responsible for the condition of trees that overhang public rights-of-way such as streets and sidewalks. Owners must be sure to keep these trees trimmed so as to provide for street lighting, pedestrian paths and vehicular clearance. They must trim back or remove any dead, decaying or broken trees lining the streetscape as needed. Ohio utility companies are responsible for pruning or removing any trees that have the potential to disrupt their power lines. 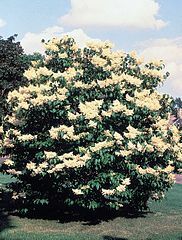 Homeowners, for their part, are advised to plant only trees that grow no higher than 20 to 25 feet at maturity, such as crabapples and flowering dogwoods. Moreover, property owners with their own electrical wires must ensure such infrastructure does not cause injury to any street shade trees. The City Forester is in charge of enforcing these codes. Residents of Dayton may also contact the Director of Urban Development for tree-related questions and resources. Dayton is located in USDA Hardiness Zone 55b at a humid continental latitude. It lies in the heart of the Eastern Corn Belt Plains, a rolling landscape with fairly fertile soils and adequate drainage for trees. American beech and sugar maple are the dominant natives in greater Dayton. Oaks, ash, hickory and walnut are also found in abundance. Dayton’s climate is ideal for growing numerous trees that produce seasonal fruit. Viable candidates include the native elderberry tree; American and Canadian plums; black and fire cherry; chokecherry; crabapples and other apple trees; partridge berry, mulberry and native persimmon trees. Unfortunately, most citrus cannot be grown outdoors here, but peaches and nectarines often persevere with a bit of effort. Redhaven has proven to be the most reliable peach variety. Homeowners should not plant any new fruit trees along a public right-of-way. The most significant tree pest in Dayton has been the invasive emerald ash borer. First introduced to Ohio in 2003, the borer has decimated the city’s more than 4,000 public ash trees. The municipality has removed large numbers of ash trees from public parks and streets. For those who have lost ash trees to the borer blight, the city recommends several replacement varieties, such as the urban-tolerant red oak, black gum and sugar maple. Other pests of concern in Dayton are the Asian longhorned beetle, the walnut twig beetle and jumping oak galls, affecting poplar, maples, elms, mulberry, black walnut, and oak trees. A commonly overlooked tree-fruit pest living in Dayton and the surrounding areas is the white-tailed deer.